PKR president-elect Anwar Ibrahim has urged the people to refute the negative assumption and presumption regarding his relations with Prime Minister Dr Mahathir Mohamad. Anwar said he was incapable of refuting all such rumours and hoped that his determination to be together with the Pakatan Harapan leaders in giving their trust to Mahathir would continue to get the support, especially among PKR members. "I made the decision to be together with the PKR and Harapan leadership, the (national) problem being faced is massive and we are unable to face (it) if there are problems facing the Harapan leadership. So, we should let the present government to be strong and only under the (leadership of) a firm prime minister can the major problem such as the 1MDB be resolved. "But this does not stop the people from instigating and make assumptions to get me to fight. Don’t instigate me against Mahathir... we have fought for 20 years. We have made peace. Don’t indulge in political instigations,” he said. He said this when speaking at a gathering with Terengganu PKR leaders and members at the Terengganu Equestrian Resort (TER), today. 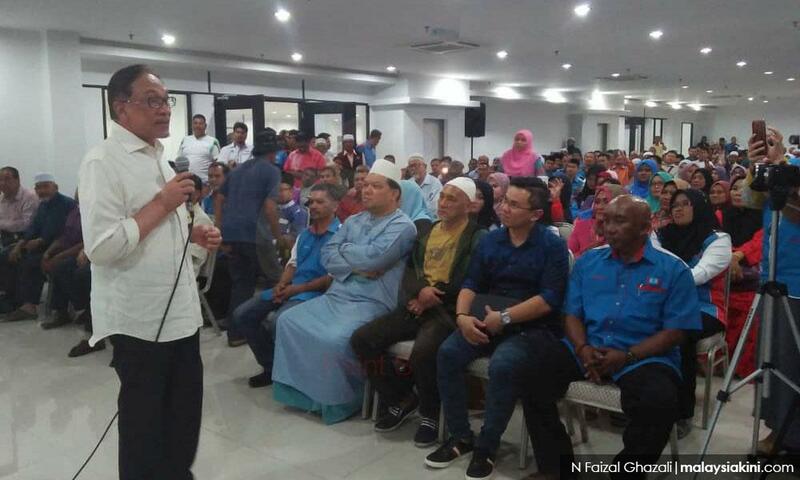 Anwar said although PKR failed to control the Parliamentary and State Legislative Constituencies (DUN) in the whole of Terengganu, cordial relations with the PAS-led state government should be developed in the interest of the people. In addition, Anwar who spoke for about half-an-hour said he sternly rejected any PKR member involved in corruption and anyone found guilty of such crime would be dismissed. Speaking at a media conference later, he described the action of several former Umno leaders who were reported to join Bersatu totally did not jeopardise relations between PKR and its allies in Harapan. He said that like the other parties that were under the Harapan patronage, PKR would continue to maintain cooperation and mutual trust with Bersatu and other component parties in the coalition. "We are still a strong party within the Pakatan (Harapan)... as long as our ties are well maintained, I should not have any doubt,” he said. "What is important is that for us to maintain good relations with Bersatu, develop mutual cooperation and trust...my personal relationship with Tun (Dr Mahathir) is also very good, so I have no fear,” he said. The gathering today was also attended by Terengganu PKR chairperson Azan Ismail. Meanwhile, Anwar, who was named as the Harapan candidate for the Port Dickson parliamentary by-election next month, said he was not surprised when Mahathir, who is also Bersatu and Harapan chairperson, announced that he would not go down campaigning for him (Anwar) in the by-election. Anwar said this matter had been disclosed personally by Mahathir on grounds that he had work constraints as the prime minister. "As the prime minister, he (Mahathir) had disclosed that he had not gone down to campaign for any by-election because I understand that he had (other) priorities (as the prime minister). But I know that he would give his cooperation and ask all parties under Harapan to join in the campaign...and he had also advised me to continue to work hard,” Anwar added. He subsequently said he did not underestimate the capabilities of the other candidates contesting against him in the by-election.